Last month I talked about my family vacation in Hawaii. We enjoyed spending the second half of our overseas holiday in Oregon with my husband’s uncle, aunt and cousins. I spent two days in Oregon in September 2013 on my way home from the ACFW conference. In 2013 I visited Mt. Hood, Multnomah Falls, Seaside, Cannon Beach, and the Tillamook Cheese Factory. I fell in love with Oregon and was thrilled to have the opportunity to return with my husband and children in March this year. 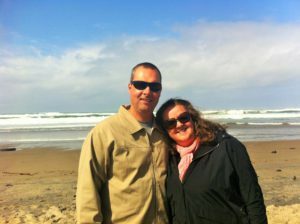 We stayed in a cottage at Glen Eden Beach on the Central Oregon Coast. A gorgeous location, and we were there during Spring Break before Easter. The spring coastal weather was interesting. We had a couple of cool, drizzly days and a few warmer, sunny days. Not too different to the early spring September weather we experience back home in Canberra. Glen Eden Beach, Central Oregon Coast. The ocean was wild and the big surf, with thirty foot waves, reminded me of the southern Australian coastline. A few brave (and possibly crazy) people swam in the ocean despite strong rips and cold water temperatures. I’m not used to wearing shoes and layers of warm clothing when I visit the beach. We witnessed ‘sneaker waves’ at Lincoln City Beach as the tide rolled in. Sirens blared from emergency vehicles within minutes of the waves crashing against the ocean wall further south and swallowing up all of the dry sand. We relocated from the sand to the promenade and watched driftwood being tossed around in the surf as if it weighed nothing. Kite flying at Lincoln City Beach. 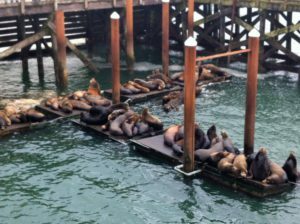 In nearby Newport we visited the Hatfield Marine Science Center and were delighted to see sea lions lounging on a barge. Sea lions at Newport, Oregon. 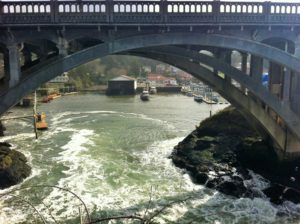 We learned that Depoe Bay is the world’s smallest harbor. We visited the Whale Watching Centre and spotted whales in the Pacific Ocean. We crossed under the harbor bridge and discovered a seal resting on a rock. My children enjoyed the locally made salt water taffy, a type of candy that we don’t have in Australia. We were in Oregon for Easter and realized that Easter is a much bigger deal in Australia from a cultural perspective. In Australia everything closes on Good Friday and church services are held in the morning. We celebrate Easter with a four day long weekend that includes Good Friday and Easter Monday public holidays. The Royal Easter Show in Sydney is one of our biggest annual events and Easter Saturday is one of our busiest shopping days outside of the Christmas period. Chocolate Easter egg displays are prominent in our Aussie stores and freshly baked hot cross buns are consumed in large quantities during Easter. 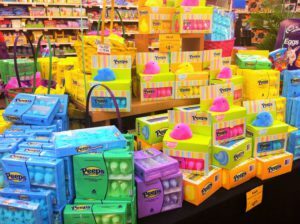 My kids discovered Peeps in the Easter in-store displays. We don’t have Peeps in Australia. We visited Salem, the capital of Oregon, and did a tour of the Capitol Building. We learned about the history of Oregon and the famous Oregon Trail that I’d read about in historical romance novels. I will confess that a large portion of my knowledge of US history has been gleaned from reading romance novels. 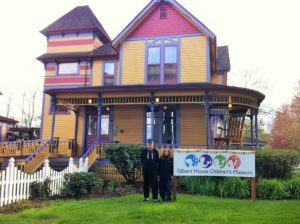 My kids at Gilbert House in Salem, Oregon. We enjoyed exploring the Gilbert House Children’s Museum in Salem. 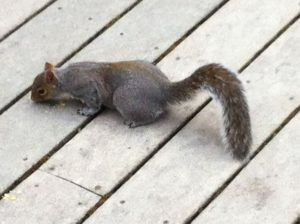 I was delighted to see a squirrel up close in the outdoor play area. My son, in particular, was excited to visit the Evergreen Aviation and Space Museum in McMinnville. A dream come true for him to see real rockets and learn more about NASA and the history of space exploration and aviation. Our trip in Hawaii and Oregon included many science, history and geography lessons for our children. 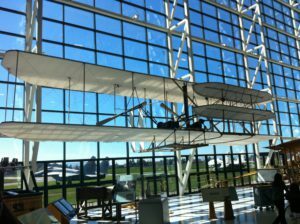 Evergreen Aviation and Space Museum. Have you visited Oregon or lived there? Do you have a favorite place in Oregon to visit? I’d love to go back and visit the family, plus explore more of Oregon and mainland USA. I enjoyed your account. I love peeps as you know. but you can keep the salt water taffy. tried it in Hawaii and for me I have to say yuck. Love the squirrel I love them and its one thing I love seeing when I go to the states. Haven’t been to Oregon. Great post, Narelle. Loved your photos and so thrilled for you to be able to share that beautiful area with your family. Thanks for sharing your trip, Narelle. Your photos are gorgeous! I’ve never visited Oregon, but I’ve traveled to California. The West Coast waters are stunning and so different from the East Coast. I live in Oregon. You hit all the fun spots. I love Multnomah Falls. My daughters like to hike around the gorge at all the falls. We love the fact that we can go to the beach one day and then the mountains the next. Oregon is so great because we have all four seasons. Now I’m not trying to sell Oregon…..we don’t really need more people here, but it is a great place to live. It sounds like you had an exciting trip. 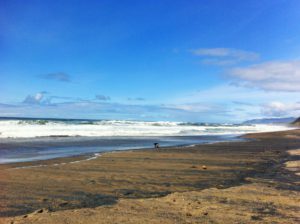 I love beach and it sounds like Oregon is one of the places I should go, though I certainly feel much more in love with Hawaii from you post last month. Hi Priscila, If you like swimming at the beach all year round, you can’t beat Hawaii :) I hope you’ll have a chance to visit the Oregon Coast. Oregon sounds wonderful, Narelle. I have never been to the US so much of my knowledge is also gleaned from novels. I go to Canberra a few times a year however! Hi Narelle, I really enjoy visiting book settings in real life, and reading books set in familiar real life locations. Canberra is a great place to visit, especially in Spring for Floriade :) I love tulips, and seeing all the spring flowers starting to bloom in Oregon was a treat. I have never visited Oregon. Thank you for sharing about your trip and for sharing the lovely photos. Oregon sounds like a place that my husband and I would love to visit. I have an uncle that lives in Medford Oregon. I’ve never had the pleasure of traveling any further west than New Orleans. (I live in Alabama). I envy your country’s celebration of Easter. Here it’s swept aside in the form of political correctness and commercialism. My daughter loves peeps. She likes to open them and leave them sitting for a few days until they get “stale” and chewy. Hi Gail, The peeps didn’t last long once the packet was opened, lol. I was surprised by the low key Easter celebrations. I grew up in Sydney and loved going to the Royal Easter Show. Unfortunately we didn’t have time to travel as far south as Medford. My son plays golf and Bandon is one place we’d love to visit. I live in western Canada and love the Pacific coast! 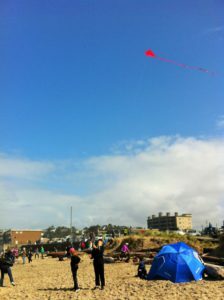 On one of our trips to Oregon, we saw the kite festival at Lincoln City! Fun to think you saw something similar in the same place. Canadians also have a statutory holiday on Good Friday and Easter Sunday. Hi Valerie, The kite flying was fun and popular with beach goers. My kids brought ‘Red Scarlet’ (the kite in the photo) home with us :) It’s great that you have Good Friday and Easter Sunday statutory holidays in Canada. The UK has the 4 day Easter holiday weekend like Australia. The subtle cultural differences between our countries are interesting. I have an aunt and uncle who live just over the border in Washington state. Usually when I go to visit them I fly into the Portland airport. Haven’t spent time any where else in Oregon except for Portland. And only a brief afternoon there. Oh my goodness, you were in my backyard! Did you get to golf while you were here? Hi Kimberly, Yes, my son did have a chance to play golf. He played 9 holes on a short course in McMinnville on a beautiful and warm sunny morning :) I’m late in replying to comments today because we spent a rainy morning at a Mother’s Day golf tournament before visiting with my parents. The rain doesn’t keep the golfers away, lol. What great memories! It’s interesting to see the things we take for granted through a foreigner’s perspective. One question, do you have squirrels in Australia? I’ve been to Sydney, but don’t remember if I saw any or not. Hi Sara, No, we don’t have squirrels in Australia, hence the Aussie fascination with them :) We have possums but they’re not as cute as squirrels, imho. Glad you enjoyed your time here, this is the reason I love the coast! I have not visited Oregon. Loved your pics though. I had no idea Easter was that much bigger of a deal in Australia than here. Kind of makes me wish I could go there for Easter one year. Thanks for sharing about your trip! Hi Julie, Easter is a nice time to visit Australia and our hot cross buns are delicious :) We don’t have Thanksgiving In Australia. Easter and Christmas are our two biggest annual holidays. Narelle, thanks for sharing one of the US states. I’ve been to Oregon, but I haven’t done all the fun stuff that you have. Hi Merrillee, You’re very welcome :) I hope you’ll have a chance to return to Oregon and do the fun stuff.